Baah baby, baah. Except not in the herd sense! 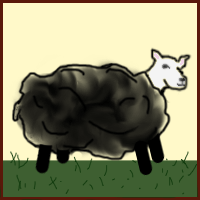 My entire life, I have been the black sheep in pretty much every aspect of my life. I’m the only child from my mother’s first marriage (I’ve three siblings by her second husband). We moved all the freaking time, so I was almost always the new girl. When you’re always on the outside, two options crop up — do you try harder to fit in with the flock or do you go your own way? I, naturally, chose to go my own way. I accepted the gift of my stubbornness (a la ‘A Wrinkle in Time‘ — ‘Meg, I give you your faults‘), and dedicated myself to being my own person. That isn’t to say that I don’t care what people think of me — indeed, I desire to be liked as much as anyone else. I just realized early on that there was no point in sacrificing individuality to ‘fit in’. I wasn’t going to fit in anyways, so why waste my time? I’ll always try to live by the Golden Rule and treat people as I wish to be treated though, ’cause that’s good karma! Mind you, it’s not easy breezy in the slightest. Even being an introvert who delights in her own company, it can get very lonely and isolating. Because I am unapologetically myself and confident in that, I’ve had a lot of people try to tear me down just to feel better about themselves. Folks get intimidated and don’t want to talk to me, or think that I’m not interested in them because I almost never have the spoons to reach out on the random. Or my ‘favourite’ — growing up, friends and family acted as if my feelings were invalid. I find it exceedingly difficult to lie about how I’m feeling, so pleasantries and I don’t get along — I hate the phrase ‘How are you?’ for the lack of actual meaning it has, and the soundbyte most people want in response as conversation filler. I also had some pretty severe stunting in being able to express my emotions, and couldn’t manage more than a vague ‘eh’ until I was into my 20s. So, I guess, it’s like pretty much everything else in my life — I am doing what I can to make the best of whatever comes my way. It’s not always possible, but there’s still learning and thinking and contemplation to be had no matter what the situation. I don’t subscribe to regret for that reason; everything that happens can serve as a lesson if I put my mind to it, good and bad. Anyhoos, I hope everyone is having a good day, and a pleasant weekend to look forward to. Clearly you were speaking to me directly because I connect with every word you wrote. Except I do have a lot of regrets, but I’m working hard on acceptance. Acceptance is hard, yo. My main demon is letting go. But I’ll get there! Being an introvert myself I can relate. I have social anxiety so what is fun for a lot of people is pretty miserable for me. Have a great weekend. Hope you feel well. Mmm, that’s definitely part of why I like to host — much easier if it’s in my own environment. Plus, I think I’m pretty good at it based on the fact friends are still willing to drive a couple of hours to hang out! I want to be you when I grow up. Learning to just be whomever I am in the moment is unfailingly hard. But I’ll just keep reading here and poke away at it, too.